Crown Series - TECO-Westinghouse Motors (Canada) Inc. 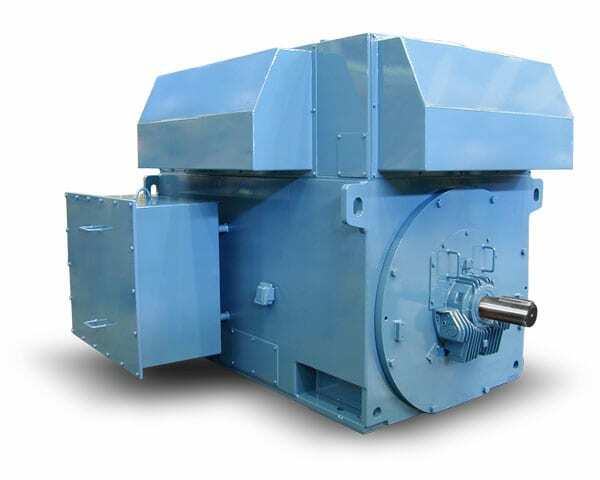 Built to the most intensive requirements of heavy industry Crown Series motors are one of the largest induction motors in the TWMI product line. Crown Series motors are custom designed to each customer’s specific application. Because of their design versatility and high operating efficiencies, Crown Series motors are the logical choice for a multitude of industries including oil and gas, petrochemical, pulp and paper, electric utility, water and waste water, marine, steel, mining and air separation. Crown Series motors can also be built to meet many specialty applications including VFD operation, CSA Class I – Division 2 hazardous locations and API541/547 standards. Crown Series motors use box frame construction to provide frames that have the mechanical strength and stability to assure years of dependable, economical performance. TECO-Westinghouse induction motor rotors are recognized as the most reliable in the industry, and their high performance standards are a hallmark of the Crown Series motors. The insulation system determines the ‘life’ of a motor. Motor capacity is influenced by the quality of insulation. TECO-Westinghouse utilizes mica tape as its base material, which is impregnated with a special epoxy resin. Impregnation is accomplished by immersion of the completely assembled stator in the special resin using a vacuum pressure cycle. This ensures outstanding resistance to heat, moisture, and chemicals, and guarantees safe operation even under the most severe environmental conditions. The Crown Series windings are considered sealed and capable of passing a complete water immersion test. Support of the coil ends is designed to restrain shock and vibration of the coil ends under heavy overload conditions such as those which occur during full voltage starting. Crown Series motors feature main lead terminal boxes constructed of 12-guage steel, gasketed for air-tight, dust-free and weatherproof protection of terminal leads. Available options include lightning arresters, surge capacitors, current transformers, special grounding devices, cable or bus bar terminations, and top or bottom lead entry. The bearing system used in Crown Series motors has been designed and engineered in cooperation with Renk for continuous, reliable performance and easy maintenance. Both anti-friction and split-sleeve bearings are offered. Our split-sleeve bearings are spherically seated and self aligning, thus easy to service in all field conditions. Crown Series motors are offered in a complete range of NEMA and IEC enclosures to meet the toughest demands of industry.